Today’s world is overcrowded with new trends, gadgets and modern stuff. Maybe in the near future we’ll have mobile phones installed in our hands or credit cards in thumbs. So this is also the case of automotive industry where technology rules. It’s not bad, but sometimes we forget about classics. The classic on four wheels reigned many years ago and beat speed limits. There were cars with highest performance and look great also today. Let’s take some examples as ´69 Dodge Charger RT or Shelby Cobra CSX 4000. These famous names remain in our heads and hearts. But there are people that don’t want only to remember those times but resurrect this golden age. We’re talking about the guys from Weineck Engineering that started to rebuild the most famous classic roadster – Cobra. So come on, take a look at the result, but some history first. Everything started in 1923 in American town Leesburg in Texas, when a boy called Carroll Shelby was born. In that time nobody had idea that this little baby would be a part of automotive history and his name would be held by the most famous roadsters. Carroll was an ordinary guy; he was studying, fighting in a war and then working at farm. But after few years he left farming and became a racer. He was racing with passion and it was noticeable that he loved cars really much. In 1954 he became a professional racer after success competitions. He became widely popular and during the years 1956 and 1957 he was honored as the Sports Car Driver of the Year by famous Sports Illustrated. Weineck Engineering is a German company from a little village of Bad Gandersheim. Two brothers (Claus and Jens Weineck) do complete modifications of engines and their installations to own modified cars. It’s definitely something amazing. Bad Gandersheim is a little town in Germany, a symbol of peace, relaxation and healing. Most of the time you can enjoy the silence, sometimes just birds are chirping. But the first sight isn’t always the best one. This town involves something unique, not often visible or audible. There are 1100 horses under the hood of one of the most spectacular cars of all times. Just get closer to it and enjoy an enormous suction opening on the hood to take care of cool and fresh air intake to this amazing engine. Suction openings are all over the car, but this one is gigantic and needs special technique. Heart of the predator is a monumental 13 liter V8 engine (780cu.cm). You can’t hear this monster every day. The engine is producing 1100hp at 7000rpm but 8000rpm is its top. Smith measurement tools needed to be modified for this car because they couldn’t handle so much power. In this case you need a real symbiosis of body and soul. Your hands and foots, all reactions need to be faster as your mind, because loops and curves came faster as it’s possible. If you’re not sure, please don’t touch the pedals. The power train and rear axle were projected to handle more than 2000Nm of torque. But be careful; remember that 300kmph takes only 10 seconds!!! No place for jokes, this is serious. First you need to take its attention, make a relationship and especially respect this strong guy. The car wear old-school three-layer 18“ Weineck wheels – 255/40 ZR18 in front and 315/35 at the back. The interior includes the finest British leather on the seats and you can choose color of your workplace. Rest of the place is covered with velour rags. A fabric roof is available in case of bad weather conditions to protect you and the interior. But when you insert the key into the ignition and slightly turn the engine on, the time goes slower. You’ll be surrounded by thunder of sound attacking from titan exhausts placed under the side sills. It’s not a sound you hear. You can feel the power from this essence. And you can control this power. Just use throttle to reveal the beast. But be aware, not electronic stuff as ABS, ASR or ESP is here to help you. Just Brembo brakes with internal ventilation and tube frame from 4“ tubes to absorb the power produced. All parts of suspension are made of high quality aluminum and titan; the rear axle has a 75% limited slip differential for you best feeling of safety. If you like to obtain this car, hurry up! Weineck plans to build only 15 exemplars. And if you became its happy owner, you’ll also receive a complete documentation and certificate with unique number of this series. And if you want to drive this car, you need to be friend with this devil, because it doesn’t mean only to have courage but also became a part of other dimension without borders. It’s great that there are still people that don’t forget about classics like Shelby Cobra. Not only that we can enjoy the greatest cars, but they pay tribute to one of the greatest sports car manufacturer as Mr. Carroll Shelby definitely is. 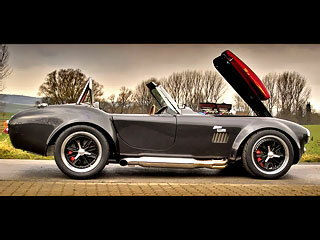 What is your opinion about the Shelby Cobra 427C tuned by Weineck?